There are many of us who are trying to find a meaning in their lives, a deeper reason for why things happen as they do—who are searching for a light to guide them in their actions. Sri Aurobindo and the Mother have written and spoken at length with great insight on various topics about the ‘what’, ‘why’ and ‘how’ of things for those who are on a path to pursue Integral Yoga. This book (in PDF format) Fundamental Faith required in Yoga is the first book in a series of compilations of guidance extracts given by Sri Aurobindo and the Mother on the topic ‘Faith’. The book begins with the explanation of ‘What Is Faith’. 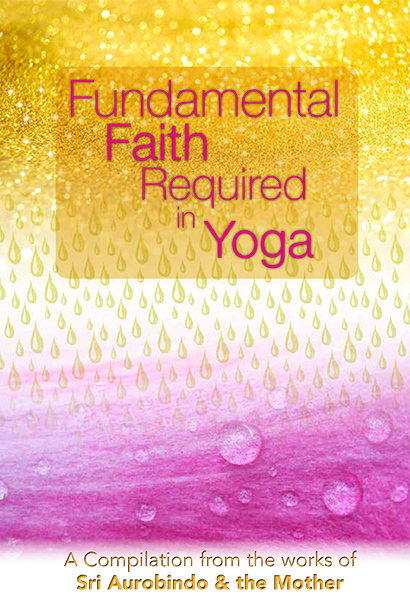 Next, it contains a list of fundamental faith aspects which are indispensable in the Integral Yoga. Thereafter, the steps by which the intellectual and emotional beliefs are purified and transformed to become ‘true faith’ are described. Finally, the quotations on following related topics, such as ‘Why faith is necessary in Yoga’, ‘Whatever is man’s faith that he becomes’, ‘How faith carries us through difficulties’, ‘The attitude of faith’, ‘Together with faith have complete trust in the Divine and Faith and Prayer’ have been given. Published by AuroPublications, this book is available for free* download.